When we first think of pollution we often think of trash by the side of the road. This type of pollution is called land pollution. Land pollution is anything that damages or contaminates the land. There are many causes of land pollution from the trash we throw away in our homes to waste produced at giant factories. Sometimes chemicals from the trash can contaminate the soil and eventually the groundwater we need for drinking. 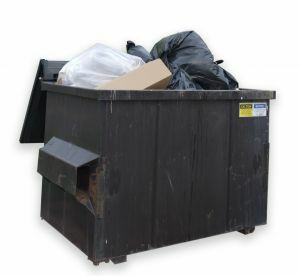 Garbage - The average person in the United States produces around 4 1/2 pounds of trash every day! That's a lot of trash. Some of this trash gets recycled, but much of it ends up in a landfill or on the ground. Mining - Mining can directly destroy the land, producing large holes in the ground and causing erosion. It can also release toxic chemicals into the air and soil. Farming - We all need farms to eat, but agriculture has destroyed many ecosystems and animal habitats. Farming also produces a lot of pollution in the form of chemicals such as pesticides and herbicides. Animal waste from livestock can also pollute the soil and, eventually, the water supply. 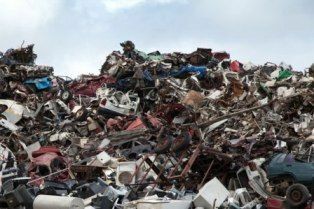 Factories - Many factories produce a significant amount of garbage and waste. Some of this waste is in the form of damaging chemicals. There are regulations in some countries to prevent harmful chemicals from getting dumped directly onto the land, but this is not the case in many countries. Land pollution can be one of the most visible types of pollution. You see trash outside of buildings or on the side of the road. You may see a large landfill or dump. This type of land pollution not only can hurt animals and their habitats, but also is ugly and destroys the beauty of nature. Other types of land pollution like mining, farming, and factories can allow for harmful chemicals to enter into the soil and water. These chemicals can cause animals and plants to die, disrupting the food chain. Landfills release the greenhouse gas methane, which may lead to global warming. Different kinds of land pollution have been known to have adverse affects on the health of animals and humans. The harmful chemicals that can get into the soil and water can cause cancers, deformities, and skin problems. Landfills are areas where garbage is placed in the land. Modern landfills in developed countries are designed to keep harmful chemicals from polluting the water. Some of the newest landfills even try to capture methane gas from escaping and use it do produce energy. In the United States there are a lot of laws and regulations to try and keep landfills from harming the environment. Trash that is made of organic substances will eventually decay and become a part of the environment. This type of trash is called biodegradable. Different types of materials take different amounts of time to decay. Paper can decompose in around a month, but it takes a plastic bag over 20 years to decompose. Scientists predict that it could take a glass bottle about 1 million years to biodegrade and that some materials, like Styrofoam, will never biodegrade. Recycle - Around 33 percent of trash in the United States is recycled. When you recycle you add less land pollution. Produce less trash - Some ways to reduce trash include not using a napkin or paper towel unless you absolutely need one, drinking water from a cup rather than a plastic bottle, and being sure to properly dispose of harmful trash like batteries and computer equipment. 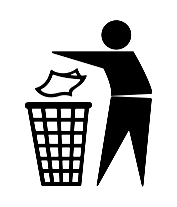 Pick up trash - Don't be a litter bug! Also, you can help out by picking up trash when you see it lying around. Kids make sure to ask your parents for help before you pick up strange trash. Composting - Get with your parents or school and start a compost heap. Composting is when you collect organic waste and store it so it breaks down to where it can be used for fertilizer. In 2010, the United States generated about 250 million tons of trash. Around 85 million tons of trash was recycled. The amount of trash per person in the United States has dropped over the last 10 years. In the last five years, the total amount of trash has dropped. At the same time, recycling rates have risen. This is good news! One way to reduce the amount of trash is for companies to use less packaging on products. Things like smaller bottle caps, thinner plastic, and more compact packaging has played a major role in reducing the amount of trash. Certain types of litter can kill animals when they get tangled or caught in it. Around 40 percent of the lead in landfills is due to improper disposal of computers and other electronic equipment.